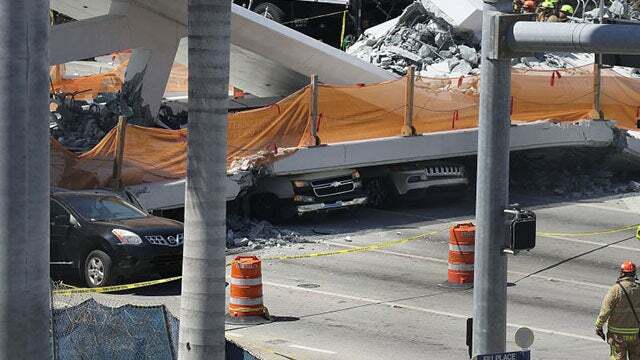 RUSH: There’s been a collapse of a relatively new pedestrian bridge at Florida International University down in Miami. There are people dead and there are automobiles trapped underneath. It looks like the whole thing. A bridge over a pretty big street, wide street just collapsed. This is not good. I was in Kansas City when a relatively new hotel opened up, and they had what were called skywalks from one area of the second and third floor above the lobby. They were suspended by the narrowest of cables, and during a Friday afternoon “tea dance,” they called it — it was something late in the afternoon — a couple of them gave way and crushed people in the lobby. It was a horrible, horrible thing. This is even bigger, even though that was indoors, this is outdoors. And the pictures coming in… It’s a big pedestrian bridge too. This is not just a one- or two-person-wide walkway. Florida International University, multiple deaths and injuries with automobiles still trapped. It looks like the whole span has collapsed here. From what I understand, it’s a relatively new bridge. RUSH: This bridge just opened this weekend. There’s gonna be hell to pay for this. Whoever inspected this thing and gave it its certificate of… Oh, man. You ought to see this. This is look like really bad.